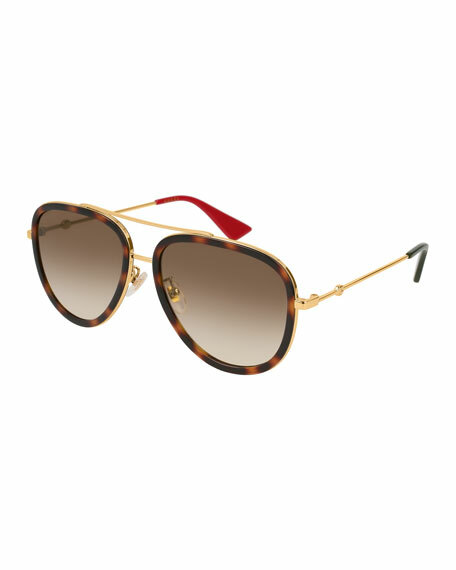 Gucci aviator metal sunglasses featuring tortoiseshell acetate rim front. Double nose bridge; silicone nose pieces. Interlocking G soldered on temples. Gucci acetate sunglasses with metal trim. Hand-applied crystals along the edge of frame front. Golden functional rivets all sunglasses to be safely folded. Lens/bridge/temple (in mm): 56-19-145. Teardrop, gradient lenses. Logo detail engraved at temples. 100% UVA/UVB protection. Made in Italy.